Prepare the Seed Tray: Put about 3 inches of milled sphagnum moss or seed-starting mix into a shallow tray or flat with drainage holes in the bottom. Place the flat into a larger container of water for several hours to thoroughly moisten the mix. Remove the flat and drain excess water. 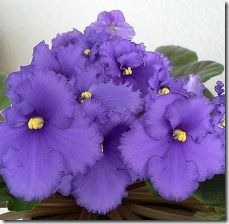 Plant the Seed: African violet seed is very tiny; it looks like dust. Fold a piece of cardboard and gently empty the packet onto it. Gently tap the cardboard, moving it around the tray to distribute the seed. Enclose the entire flat in a plastic bag and seal. Wipe off any excess moisture that collects inside the bag. When the seedlings begin to show, gradually open the plastic bag to expose the seedlings to air. Keep the mix moist at all times by gently misting with a weak fertilizer solution. 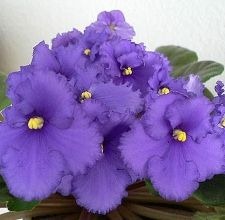 Use an African violet food and dilute it to 1/4 the strength recommended on the label. When the seedlings are large enough to see clearly, gently tweeze out seedlings until the remaining plants have space all around them. As the seedlings grow larger and crowd each other, continue to thin them until they are large enough to handle. Transplant the seedlings to individual pots, using pots just slightly larger than the root system. Continue to move plants up as needed until they occupy 4 or 5 inch pots, depending on plant size desired. Leaf span should be 3 times the size of the pot. You can also set seed on your own plants. See an African violet handbook, such as Helen Van Pelt Wilson’s African Violet Book (Hawthorn Books, 1970, page 101), for directions.